We would like to thank all of the employees of Trinity Transportation for their hard work and dedication over the years, as well as our community for choosing Trinity Transportation as their transportation service. With the help of our employees and community, Trinity Transportation has served Southeastern Michigan for over 30 years. More than a million people have ridden on a Trinity bus and thousands have used Trinity to solve many different transportation challenges both personal and professional. We are excited to announce that Trinity Transportation has been acquired by National Express. As of January 1st, 2017, Trinity Transportation has officially joined the National Express family. 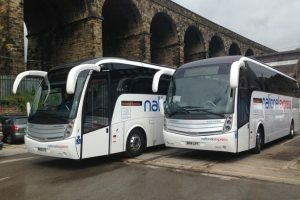 National Express brings a commitment to excellence, safety, customers, people and the community. National Express has a great track record making excellent collaboration between communities, schools and businesses. Located in 38 states and 4 Providences, National Express services more than 500 school districts, operating 21,500 school buses in the US., as well as transports more than 16,000,000 passengers annually. Both Trinity and National Express share a passion for providing transportation solutions all while holding safety as the highest priority. What does this mean for you? To start: exciting new integrations, an increased feature set, and a continued focus on making transportation better and more useful than ever. 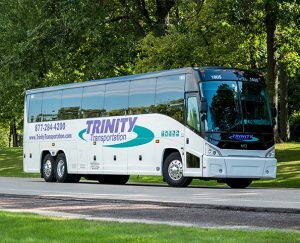 Our mission at Trinity will continue to provide the excellence in safety, customer service and hassle-free transportation. We will continue to operate as a standalone service, so you don’t have to change a thing about the way you are currently using Trinity. For more in formation, please visit www.nationalexpress.com. Stay tuned over the coming months for more exciting news.